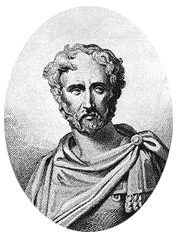 Gaius Plinius Secundus (23 – 79), better known as Pliny the Elder, was an ancient author and natural philosopher of some importance who wrote Naturalis Historia. Quoted in Pliny (1927) [c.100 CE]. "LXV, to Tacitus" (in English) (eBook). Letters of Pliny. translated by William Melmoth. Hoboken, NJ: Bibliobytes. pp. p. 48. ISBN 0585049971. "Here he stopped to consider whether he should turn back again; to which the pilot advising him, "Fortune", said he, "favours the brave; steer to where Pomponianus is."" Man alone at the very moment of his birth, cast naked upon the naked earth, does she [Nature] abandon to cries and lamentations. Cincinnatus was ploughing his four jugera of land upon the Vaticanian Hill,—the same that are still known as the Quintian Meadows,—when the messenger brought him the dictatorship, finding him, the tradition says, stripped to the work. The agricultural population, says Cato, produces the bravest men, the most valiant soldiers, and a class of citizens the least given of all to evil designs…. A bad bargain is always a ground for repentance. The bird of passage known to us as the cuckoo. Translation: With a grain of salt. It was a custom with Apelles, to which he most tenaciously adhered, never to let any day pass, however busy he might be, without exercising himself by tracing some outline or other,—a practice which has now passed into a proverb. It was also a practice with him, when he had completed a work, to exhibit it to the view of the passers-by in his studio, while he himself, concealed behind the picture, would listen to the criticisms…. Under these circumstances, they say that he was censured by a shoemaker for having represented the shoes with one latchet too few. The next day, the shoemaker, quite proud at seeing the former error corrected, thanks to his advice, began to criticise the leg; upon which Apelles, full of indignation, popped his head out and reminded him that a shoemaker should give no opinion beyond the shoes, —a piece of advice which has equally passed into a proverbial saying. Pliny... makes the statement, and for untrustworthiness of statement he cannot easily be surpassed. Pliny the Elder – Biography and summary of Natural History.